in a handful of poor states. Haiti and Burkina Faso,” he told reporters in New Delhi. weeks, while grain supplies were at their lowest since the 1980s. food,” Diouf said after meeting India’s farm minister, Sharad Pawar. 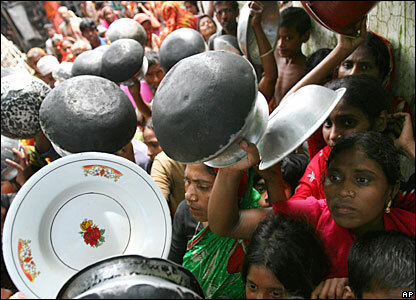 the challenge of food scarcity. deployed security personnel to guard its warehouses. billion people out of 6 billion,” Diouf said. average globally since last summer. year to 400 a year in the past two decades. crushing bribes demanded by government officials and police. maintain is the only way to make ends meet. it to private bakeries at up to $37 a sack. whose bakery receives 68 sacks of subsidized flour every day. 200 pounds ($37) a month, wouldn’t I sell my conscience?” he said. tightened its control over wheat in recent days. eased in the capital Cairo, though they persist in many provinces. have staged a series of strikes for higher wages in the past year. promised to meet their demands on raises and health benefits. reduce the corruption that has long been a way of life in Egypt. but obligatory,” Amin wrote in the independent daily Al-Masry Al-Youm. the justice secretary said Thursday. was investigating whether any of those facilities had hoarded grains. well as the effect of disease, pests and climate change on crops. advantage of the situation to stir up public unrest. making the Philippines the world’s biggest rice importer. jump another 40 percent to $800 per ton in April. to some 2 million people in the region. Sudan; 36 trucks remain missing, and 24 drivers are unaccounted for. representative Kenro Oshidari said in a statement. cereal production, have all helped boost world prices. on food, down from about 70 to 80 percent in the early 1970s, Mr.
makes it very difficult for us to find rice at an affordable price. quickly than anyone expected, he says. chickens – or human thieves,” says Mr. Sarayouth. ethanol, so prices have shot up,’ she said. government will take them over. and imposing food price controls. and so cannot be blamed to for today’s higher food prices. fertilizer prices which rose by 200 percent. to get food to urban markets. independence.” For example, Congress passed and President George W.
goal that 10 percent of transport fuels come from biofuels by 2020. Australia have experienced extreme weather. cutting fertilizer use by 50 percent. at which point world population begins to slide back downwards. Kazakhstan have imposed restrictions on grain exports. and social dangers for the rest of the world. Citicorp, Merrill Lynch and Countrywide. of people are going to waiting outside with pitchforks. outrage is met with barely a beep. producers and their flacks to rationalize ever higher prices. end of the “Green Revolution”. This land rush is being accelerated by an unlikely source: biofuels. looks less green than oil-derived gasoline. grasslands that store enormous amounts of carbon. cattle pastures, so Brazilian cattlemen are displaced to the Amazon. haunt the planet for generations–and it’s only getting started. spurred some landowners to deforest to avoid redistribution. see the expansion on cattle pastures and the Cerrado,” he says. size of Texas, so it stores its share. now be too powerful to constrain. farm lobby, the most powerful force behind biofuels on Capitol Hill. while mandating 36 billion gal. (136 billion L) of biofuel by 2022. This will provide a huge boost to grain markets. petroleum-based fertilizers and distilleries emitted lots of carbon. were confident that technology would progressively increase benefits. raise food prices, so the poor will eat less. That’s the reason a U.N.
effects of biofuels, they increased their prediction to 1.2 billion. without subsidies and with severe restrictions on deforestation. save a tree, but he’s come to recognize the importance of the forest. so without incentives to prevent deforestation, the Amazon is doomed. energy-efficient lightbulbs and homes and factories and lifestyles.